1. Top tips for matching headings questions. 2. Examples of synonyms and a short exercise. 4. Short sample text with answers and analysis. This reading skill is testing your ability to understand the difference from a main idea and a supporting point. Matching heading questions can be quite challenging, so here are some top tips to remember . 1. Matching heading questions are not in order in the text, unlike True False Not Given or Yes No Not Given which are always in order. 2. You can’t just get the meaning by skimming alone, you need to understand the paragraph by reading in detail if you are unsure of the answer. 3. Read the first 2 sentences and the last 2 sentences of the paragraph to get a good idea of meaning. Look out for synonyms and antonyms. 4. Think about how the heading and words in the paragraph could be paraphrased. Underline key words in the heading then go through the paragraphs. 5. Watch out for synonyms, it is very important to work on your vocabulary. 6. Do the matching headings questions first because it takes longer, then the other task questions will be easier. 7. Spend no more than 2 minutes on each question, if you cant get it then move on to the next one and come back later to that question, in the worst case if you still cant get it then guess. 8. Remember that some headings often look similar and students can’t decide the best match. 10. 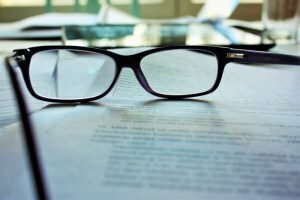 A good practice technique is to read the paragraphs first and then think of your own ideas for a heading. Examples of how synonyms work in reading. Choose 6 words from the list above that match, there is more than one possible answer. 1. The _________ of nuclear power is that if there is an accident it can have dire consequences. 2. Global warming pose __________ to many species. 3. The _______ that humans play in the destruction of the environment cannot be under estimated. 4. Education can be a huge _________ in a persons mental development. 5. Economic ___________ impact the crime rate in most developed countries. 6. The government decided to _____________ a rescue effort to reach the survivors of the Earthquake. 1. The disadvantage of nuclear power is that if there is an accident it can have dire consequences. 2. Global warming poses a risk to many species. 3. The part that humans play in the destruction of the environment cannot be under estimated. 5. Economic problems impact the crime rate in most developed countries. 6. The government decided to co-ordinate a rescue effort to reach the survivors of the Earthquake. 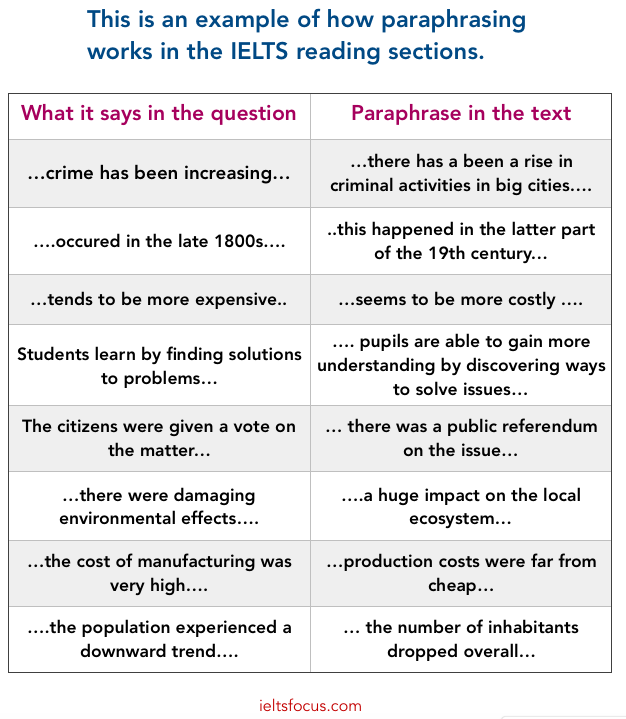 Of all the skills you need to develop in IELTS, I would have to say that understanding how paraphrasing works is the number one skill, but you need to have good vocabulary. Understanding how synonyms and antonyms work in short text is important. below is an example of how this works in reading. By the way, don’t worry if you have no idea about the topic, the IELTS reading test is not trying to test your general knowledge, it is designed to test your vocabulary and reading skills. Some technical words you just will not understand but you can often guess or predict meaning, you do not need to understand every word. Here is a link about guessing meaning from context. Now lets practice this type of question, here is part of a sample text and matching headings exercise. I got this from a PDF download from ielts.org . You can download it here. The role of governments in environmental management is difficult but inescapable. Sometimes, the state tries to manage the resources it owns, and does so badly. Often, however, governments act in an even more harmful way. They actually subsidise the exploitation and consumption of natural resources. A whole range of policies, from farm-price support to protection for coal-mining, do environmental damage and (often) make no economic sense. Scrapping them offers a two-fold bonus: a cleaner environment and a more efficient economy. Growth and environmentalism can actually go hand in hand, if politicians have the courage to confront the vested interest that subsidies create. All these activities may have damaging environmental impacts. For example, land clearing for agriculture is the largest single cause of deforestation; chemical fertilisers and pesticides may contaminate water supplies; more intensive farming and the abandonment of fallow periods tend to exacerbate soil erosion; and the spread of monoculture and use of high-yielding varieties of crops have been accompanied by the disappearance of old varieties of food plants which might have provided some insurance against pests or diseases in future. Soil erosion threatens the productivity of land in both rich and poor countries. The United States, where the most careful measurements have been done, discovered in 1982 that about one-fifth of its farmland was losing topsoil at a rate likely to diminish the soil’s productivity. The country subsequently embarked upon a program to convert 11 per cent of its cropped land to meadow or forest. Topsoil in India and China is vanishing much faster than in America. In section B the main keywords are “farming, food output, yields, cultivation, irrigation, crop breeding, fertilisers” This clearly shows that the paragraph is about farming methods and production of food. So section B is v.
Section C keywords are “deforestation, pesticides, contaminate, soil erosion, high yield crops, topsoil” This points to environmental issues, also there are examples of USA, China and India regarding topsoil diminishing, which means eroding or reducing. Its clear that the matching heading is i .